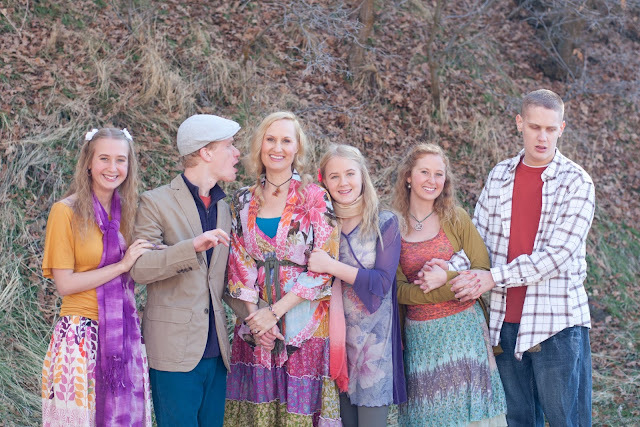 Four children within five years, and three of the four have Fragile X Syndrome. Take a moment to imagine it. LeeAnn Taylor, the latest writer in the Fragile X Writer's series, tells the story of her family, their discovery of Fragile X, and how she accepted the changes to her life plan. In addition to being a mother to five children, LeeAnn is an actress, author, and producer living in Santa Clarita, California. She has written two spiritual guide books, Magnify your Glow and Magnify your Glow for Teens, and she produced and stars in the film "Bluetiful," which exposes the largely hidden world of the disabled and those who care for them. Her autobiography, The Fragile Face of God; A True Story About Light, Darkness, and the Hope Beyond the Veil, comes out in the spring of 2013. LeeAnn has had the same challenges as so many of us have had, raising children with Fragile X, but she didn't let the Fragile X diagnoses of her children be a barrier when she set out to achieve her dreams. She is an inspiration to anyone who dreams big, but has doubts and fears along the way. Find out more about LeeAnn Taylor and her books and films at LeeAnnTaylorStory.com. ﻿I had stars in my eyes from day one. ﻿﻿Like most girls in high school, I had plans. Big plans. I was fearlessly ambitious with grand visions of happiness and a successful life in the movie spotlight. Marriage and less-than-glamorous-motherhood seemed somewhere in the far distance, undecided and inconvenient. After graduation, I veritably bounded away from the manicured grounds of my suburban high school, armed with top honors in performing arts, and into the bold and fascinating new land of adulthood. I was ready to take on the world. Or so I thought. After a year of film school, performing in Disney parades, and dating, I fell fast into the arms of a charming young man and was married at age 19. Baby #1 came lightning fast! Like my mother before me, my sisters, and my friends and neighbors, I expected parenthood to be full of bliss – an enchanting life of adorable snap-shot moments and a rite of passage into life’s noble endeavors. And in the beginning, it was. My new baby daughter, Jaede, was exceptional –meeting all of her milestones early and bursting with vibrant energy. She truly inspired me and we spent hours together every day forming an unbreakable bond. ﻿﻿Well-meaning family and friends assured me there was nothing to worry about, but in my heart I knew there was something very wrong. I thought maybe I wasn’t mothering him the right way. He didn’t respond to my affection or acknowledge when I called his name. Am I a bad mother? I wondered. Meanwhile, I became pregnant again. Life was progressing at unbelievable speed. Jaede became mama’s-little-helper; however, that precious mother-daughter time became increasingly rare and I began to feel guilty for neglecting her. Out of necessity, most of my attention went to Quinn’s constant needs. When Quinn was 2, we took him to a university medical center. He was still non-verbal and exhibited many strange behaviors such as hand-flapping, rocking against the wall, and playing with his regurgitated food. The pediatric neurologist diagnosed him with autism and ordered further testing to rule out hearing loss. During the months that followed, I researched a variety of childhood developmental delays that can affect behaviors. My heart did not want to believe that my child had a disability. I searched desperately for anything that was treatable, curable, or otherwise temporary. My son, Shale, was then born – a healthy boy with bright red hair and hazel-gray eyes. He was much more affectionate than Quinn was and loved to cuddle with me. Because of the differences between them, I wasn’t concerned for Shale’s development. Our pediatric neurologist had a “hunch” about some of Quinn’s physical attributes and ordered a genetic screening for him. At the age of 3, Quinn was officially diagnosed with Fragile X Syndrome. I had never heard of Fragile X and there was no history of it in my family. Things were about to change dramatically in my life. My new son, Shale, was beginning to exhibit similar behaviors. A year and a half later I gave birth to another daughter, Faith, rounding out our total count to 4 children under the age of 5. I was only 26 years old. It was at this time that my son, Shale, tested positive for Fragile X Syndrome. Nine months later Faith was also diagnosed. I was devastated. My husband and I made it through the dark days with a sense of humor developed out of necessity. It was our underlying defense mechanism, our method of self-preservation, subconsciously cultivated as a means of protection against the hopelessness. With Shale and Quinn cruising around the house in nothing but a diaper like natives in a loincloth, Faith sitting in her baby seat watching the spectacle with wide eyes, and Jaede talking away as loud as she could to compete with all the commotion, laughter was our only safeguard for sanity. We made up all kinds of nicknames and catchphrases for our children. To keep from going crazy, we had to mock the horrific things our sons did, the grotesque messes they made. Toilet humor became a staple in our home, as did songs with spoofed lyrics about Quinn’s animalistic eating habits and Shale’s marathon diaper changes. We were like the urban hillbillies of Yuppieville. Everything in my life had been redefined. In some circles, I became known as “the mother of the retarded children.” In other circles, I was referred to as “amazing” and “remarkable.” I would love to say that I felt amazing – or remarkable – but I didn’t. Instead, I struggled with feeling like a failure as a mother. I often felt like no one in the world understood what I was going through. My husband grew distant and detached from our family’s needs. My life’s plans seemed to disintegrate almost overnight. Quinn’s and Shale’s behaviors eventually escalated into violent episodes, leaving me with bite marks and bruises. Even in Fragile X circles, my sons’ developmental challenges seemed unusually extreme, isolating me even further. They both remained non-verbal and in diapers, functioning barely at the level of a 2-year-old. Jaede grew up so fast, she became like a third parent in our home. She struggled with anxiety and stress of her own, and felt neglected most of the time as her Fragile X siblings took priority time after time. I simply could not meet everyone’s needs, no matter the size of my efforts. There were nights when I felt so hopeless that I literally prayed for death. And there were nights when I felt luminous angels surrounding me. I felt like I was being broken down and rebuilt, one painful piece at a time, as my selfishness and short-sightedness were stripped away in the process of caring for my special needs children. I watched a transformation take place within myself – from a young, starry-eyed girl with big plans that didn’t include compassion or courage, failures or life lessons, to a woman stronger than I ever imagined I could be. Faith had no concept of what an angel was nor the vocabulary to express it. “Your brother is Quinn,” I responded. “Quinn is an angel,” she stated again. “And Shale is your brother, too,” I said. Now I was testing her, remembering back to the day when Jaede, at two years old, had said the very same thing about Quinn. “Shale is an angel,” she replied. My heart skipped a beat. And then the first of many miracles happened. I became unexpectedly pregnant with a beautiful little girl. I named her Psalm – a sacred song – and I call her my “miracle baby” because my husband had undergone a vasectomy after we decided not to have more children. And because Psalm does not have Fragile X syndrome. Her presence is pure joy. She is the perfect friend to her big sister, Faith. And she is a blessing in the lives of everyone who knows her. Psalm’s birth was pivotal for me. After this event, many life-altering changes occurred including a magnificent intervention beyond the grave. I am alive today because of it. This year, Quinn will be 22 years old and Shale will be 20. They both live in a professional home now, they are both still non-verbal and require 24-hour supervision. But they are absolutely amazing and remarkable – true giants in my eyes. I treasure them and the lessons they teach me. My precious Faith is now 17 and has been fortunate to be only moderately affected by Fragile X Syndrome. She reads, writes, speaks very well, and is a fantastic cook. Jaede is studying humanitarian work and Psalm is an avid reader. Mothering these children is the most challenging yet remarkably beautiful experience of my life, full of transcendent highs wrapped up in a series of unpredictable moments, struggles, and triumphs. For a long time I believed that having disabled children would prevent the work I felt driven to do in my life, but I’ve since discovered that it was in the lowest, darkest moments with them where my life’s highest vision was born. I still have “big plans,” but they look a little different now: I write books that inspire people, I make films about the triumphant human spirit, and I mentor people of every walk who are looking for hope. Thank you, Quinn, Shale, and Faith, for revealing to me what I am capable of and for showing me the way.